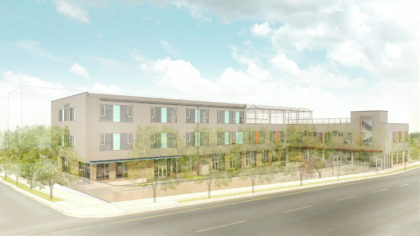 The Two Schools project involves new construction of a 3-story (approximately 47,700 sf) private school. The building will house two separate school identities: an approximately 200-student Elementary School and Pre- School (grades Pre-K – 5), and an approximately 100-student Girl’s Middle School (grades 6-8). Each school will have their separate entry and program spaces, with some shared spaces such as the gymnasium, library, and exterior play area. Associated parking and Pre-K loading will be provided on-site, at grade within a drive aisle serving as a buffer between the development and north parcel. A 15,000 SF open exterior play area is planned for the southwestern portion of the site.